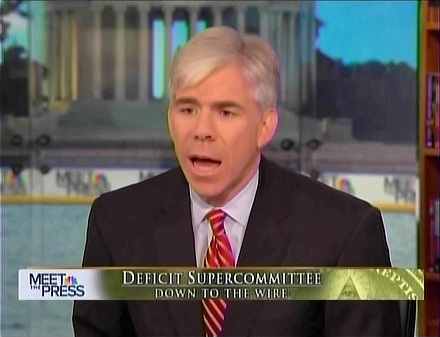 While grilling Arizona Senator Jon Kyl on NBC's Meet the Press on Sunday, host David Gregory tried to bolster the argument for tax increases: "The Bush tax cuts...real deficit hawks, many of them happening to be Republicans....said let them all expire for everybody. For the rich, for the middle class. If you really want to get serious about the deficit, let the Bush tax cuts expire for everybody." Here were Gregory's examples of GOP "deficit hawks": "...Alan Greenspan, former Fed chief; Michael Bloomberg, now the independent mayor of New York..." He also touted the expertise of "Democrats like Peter Orszag, who ran the Budget Office for this president..."
Moments later, Gregory touted Democratic talking points blaming the GOP for the failure of the supercommittee to real a budget deal: "Democrats would say, 'Look, this is not bipartisan failure. This is intransigence by the right, an unwillingness to stop protecting the wealthiest Americans. '....Democrats argue it's simply not fair, you've dug in your heels, you're not really negotiating in good faith." Gregory began the line of questioning by fretting over Republicans pledging not to raise taxes: "The question is whether the fix was in from the beginning. Grover Norquist, the anti-tax crusader in Washington who, if you hear critics, holds sway over all the Republicans on Capitol Hill..."
Later, Gregory pressed Kyl: "Do you feel some urgency to get this done? What about the potential of another downgrade of America's debt?" In his final question to the Arizona Senator, Gregory wondered: "You're retiring from the Senate. Are you embarrassed at what Congress has been unable to do on the toughest issues facing this country and this government?" DAVID GREGORY: Senator Kyl, let me begin with you. Deal or no deal? JON KYL [SEN., R-AZ]: Well, there's no deal yet; but, as both Senator Kerry and I have said, we're not going to quit until the stroke of midnight. GREGORY: But where is there potential for a breakthrough? Anywhere? Or is this going to fail? KYL: It's been very hard so far, and the – I think it's illustrated by the last offer made by Republicans. We have not been able to do entitlement reform or tax reform. And so Republicans said, "Well, let's see if we can salvage something here. Let's take the areas where we've at least had some agreement in our meetings, put those together." And it adds up to about $640 billion that we could actually save in increased costs or, in some cases, derive some revenue from asset sales and that sort of thing. Our Democratic friends said no to that offer because it didn't raise taxes. And I think it tells you a lot, and that is that in Washington, there's a group of folks that will not cut a dollar unless we also raise taxes. GREGORY: Alright. Well, the other side of that is how Republicans feel about taxes. And it is the heart of the matter. The question is whether the fix was in from the beginning. Grover Norquist, the anti-tax crusader in Washington who, if you hear critics, holds sway over all the Republicans on Capitol Hill, this is what he said to The Hill newspaper this week. The headline, "GOP leaders promised me no new taxes. I've talked to the House leadership and the Senate leadership. They're not going to be passing any tax increases." So was this really a good faith offer to raise taxes? GREGORY: But let's talk about the balance. KYL: Well, let me just finish my sentence. KYL: Through the tax code, which would largely fall on the upper two brackets of taxpayers. That was a big breakthrough for Republicans. GREGORY: But let's talk about the full, balanced picture here, which is that Republicans wanted to have a conversation in the course of trying to lower the deficit about extending the Bush-era tax cuts, which the Congressional Budget Office would say has an impact of $3.7 trillion on the deficit. So, in the name of lowering the deficit, you want to extend those tax cuts, which increases the deficit and would not be off-set by the tax increase that you were talking about. GREGORY: Senator, you're not answering my question. KYL: I'm make – I'm getting to the point here. This is not about extending the Bush tax cuts, it was about trying to do entitlement reform on the mandatory side of the budget. Now, when our Democratic friends made it very clear that they weren't going to do anything without raising taxes, we then turned to, what is the best way to derive revenues? Is it to allow the current code to expire and have the biggest tax cut in the history of our country? No. KYL: A tax increase. I'm sorry. We thought that the better way to do that was to limit the deductions and credits, the so-called loopholes, derive the revenue that way and, in doing so, you can both reduce some of the rates and have enough revenue to actually apply it to deficit reduction. And that amount was $250 billion. GREGORY: The Bush tax cuts, though, I come back to because real deficit hawks, many of them happening to be Republicans – Alan Greenspan, former Fed chief; Michael Bloomberg, now the independent mayor of New York; and Democrats like Peter Orszag, who ran the Budget Office for this president, said let them all expire for everybody. For the rich, for the middle class. If you really want to get serious about the deficit, let the Bush tax cuts expire for everybody. 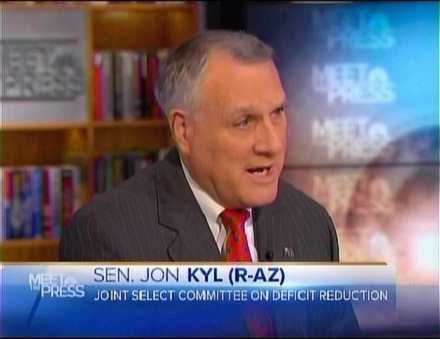 KYL: If you really want to get serious about the deficit, our country has to grow economically. We have to put people back to work. That's what creates wealth that can be taxed. We're not going to tax our way out of this, we need to grow. And you can't grow if you raise taxes in the middle of a recession. That's what President Obama said when, when unemployment was at 9 percent a few months ago. He said don't raise taxes in a recession. And he's right. That impairs job creation by taking more money from the very people, primarily small business folks, who will create most of the jobs coming out of the recession. GREGORY: Let me ask you this, is there any potential deal that's still possible, even if it's smaller? KYL: ...would, would have provided. And the reason we did it that way is so that it wouldn't affect the tax code that goes right to business decisions, to investment decisions. Leave that alone so there's some certainty in the private sector and, instead, focus on eliminating these loopholes, these so-called tax expenditures. GREGORY: And is there a basis for anything there? KYL: Well, I hope that there – you know, hope springs eternal. GREGORY: But I just want to come back to this one point because the other side of the political spectrum, Democrats would say, "Look, this is not bipartisan failure. This is intransigence by the right, an unwillingness to stop protecting the wealthiest Americans." Everybody would have their taxes extended under the Bush tax cuts under the president's plan making more than $250,000, there's about $800 billion for the wealthiest Americans that he wants to raise rates on. Even your deal here, the Republicans wanted, would've protected rates, would've brought down rates on the wealthiest Americans, and Democrats argue it's simply not fair, you've dug in your heels, you're not really negotiating in good faith. KYL: But in our plan, the wealthiest Americans would pay more taxes than they do now. They would pay more taxes to create $250 billion, which comes from the itemizers, and that's primarily people in the upper brackets, that money would go to reducing the deficit. In addition, everybody could potentially have their income tax rates reduced a little bit by the elimination of those or reduction in the value of those so-called loopholes, as they apply to anybody who itemizes their tax. KYL: And, David, just make one more point. Nothing new came out of this. From the Democratic side it was the same thing: raise taxes, pass the president's jobs bill, no entitlement reform. On the Republican side, you had the one true breakthrough and that was this new concept of tax reform, which could generate revenue from the upper brackets for deficit reduction. GREGORY: Lower the upper brackets, do, do far less than Democrats wanted on new net tax increases, and extend the Bush tax cuts. And by the way, House Republicans were probably not going to vote for that anyway. KYL: David, yes. In fact, I think this bill, the Toomey proposal, would even pass the United States Senate, which is controlled, as you know, by the Democrats. Hear what we were saying: There would be a net new amount of revenue, $250 billion, of which would go to deficit reduction. That was our offer to the Democrats in addition to which there was other revenue, as you know. It totaled about $500 billion. This had never been proposed by Republicans before because it would mean that people in the upper brackets, whatever their tax rate was, would be paying more taxes because their loopholes, the deductions and credits that they take advantage of would no longer exist. GREGORY: Alright, I want to ask you quickly where we go from here. So the question is, if you fail ultimately there are automatic spending cuts that happen. One of the big ones is on defense. Secretary Panetta has said the following about the impact of that. "Sequester," he said, which is the process by which those automatic triggers go into place, "will lead to a hollow force...In effect, it invites aggression." He also said in a letter to Senator McCain of Armed Services, "The impact of these cuts would be devastating for the Department [of Defense]...As a result, we would have to formulate a new security strategy that accepted substantial is of not meeting our defense needs." Will you support a work around of some measure that would not – that would prevent this automatic tax cut from going into place? Excuse me, automatic spending cuts from going into place. KYL: Spending cuts. What people would know is that one way or another we're going to have $1.2 trillion in reduced spending. It can either be done the ugly way, which would happen if our committee fails, or we can do it more intelligently. But we do have the opportunity, even if the committee fails to work around the sequester, so that we still have $1.2 trillion in savings over 10 years, but it's not done in the very Draconian way that, that Secretary Panetta is referring to. Now, that'll require work on Congress's part and some agreement. But I can't imagine that knowing of the importance of national defense that both Democrats and Republicans wouldn't find away to work through that process so we still get the $1.2 trillion in cuts, but it doesn't all fall on defenses as Secretary Panetta pointed out. GREGORY: So you don't think the defense cuts will happen? KYL: Well, I, I, I think there's a way to avoid that if there's good will on both side. And again, I think when the reality sets in, even those Democratic friends who would like to see more defense cuts, when people like Secretary Panetta said this would be extraordinarily bad policy for the national security of the United States, we'll find ways to work around that. GREGORY: Do you feel some urgency to get this done? What about the potential of another downgrade of America's debt? KYL: Well, again, there's going to be $1.2 trillion in savings whether the committee agrees on a method of doing it or it happens automatically, as you say. So this shouldn't foster a downgrade or, or a run on the market or anything like that. The $1.2 trillion in savings occurs one way or the other. GREGORY: You're retiring from the Senate. Are you embarrassed at what Congress has been unable to do on the toughest issues facing this country and this government? KYL: The frustration of the American people at our inability to tackle these tough problems is very real, and I absolutely agree with that frustration. It is – their representatives in Congress ought to do a better job than Congress has been, been able to do. And I'll just go back to this: When our Democratic friends are unable to cut even $1 in spending without saying it has to be accompanied by tax increases, I think that tells you all you need to know about our runaway spending. GREGORY: Alright, we're going to leave it there. Senator Kyl, thank you very much.